In support of the Frist Art Museum exhibit Van Gogh, Monet, Degas, and Their Times: The Mellon Collection of French Art, I will lead a one-day plein air workshop on April 6, 2019 in Nashville. Details and registration info here. Several new works included in Field of Vision exhibit through February 2019 at Anne Irwin Fine Art in Atlanta. Opening reception February 8, 2019 6-8 pm. Several small works and Field Studies on exhibit at Anne Irwin Fine Art in Atlanta from November 2, 2018 through the end of the year as part of the annual Small Works show. Saving Space, the collection of new work based on sites protected with the assistance of The Land Trust for Tennessee will be on exhibit at Zeitgeist Gallery during the months of November and December 2017. Opening reception is November 4 from 6-8pm with an artist Q&A on November 11 at 1 pm. Ten percent of the proceeds from sales of this show will be donated to The Land Trust for Tennessee. For information and inquiries, see Zeitgeist Gallery. Milky Way Farm, 48x72 inches, oil on canvas. Much gratitude to the National Park Service and Whiskeytown National Recreation Area for hosting me as Artist in Residence in October. Completed nearly twenty paintings and studies of the Whiskeytown area in Northern California, and donated a piece to the permanent collection on location. This program offers a valuable experience of quiet focus, enabling artists to immerse themselves in this stunning environment. 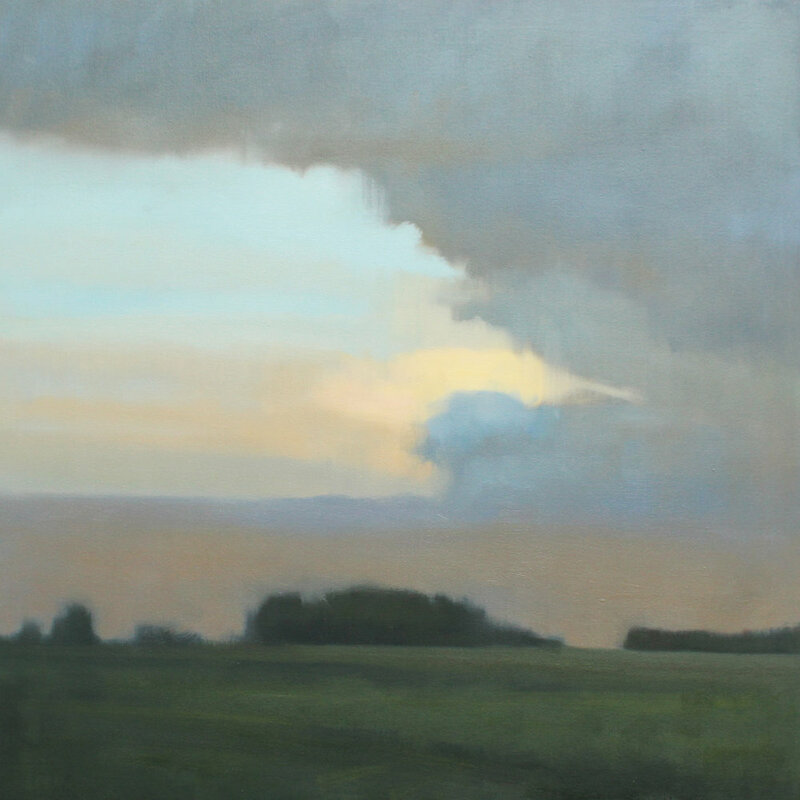 See several new works included in the group show Natural Beauty at Anne Irwin Fine Art in Atlanta, opening September 15. Join us at the reception from 6-8:30 p.m.
See the collaboration with Eric Adler for this year's Fashion Happening Nashville event, Wearable Surfaces, Friday, August 4th from 6-9 p.m. at Zeitgeist Gallery. Tickets available here. More details at the FHN website. Megan was honored to receive the Pitch Perfect award at the conclusion of the 2016 Periscope Artist Entrepreneur Training, a program of the Arts and Business Council of Greater Nashville. This program is a valuable resource for artists across many disciplines and serves to support a more robust cultural community in Middle Tennessee. 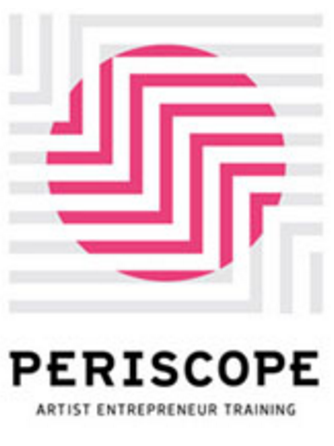 Find out more about Periscope and ABC here. 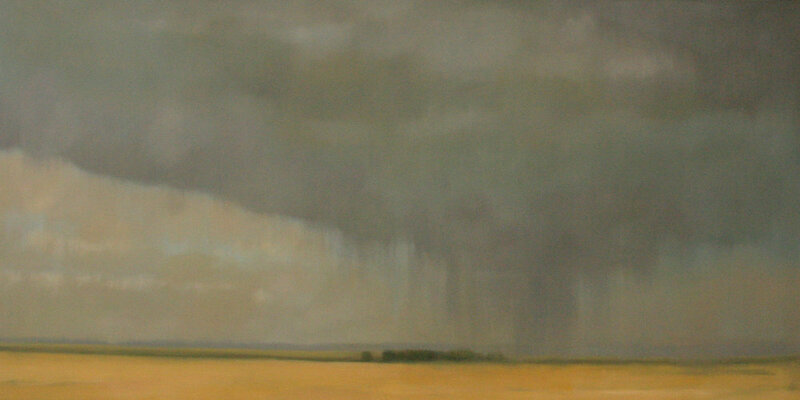 Grounded (diptych), 48x120 inches, oil on panelA new exhibit featuring the landscape of South Central KY opens November 10, 2014 at SKyPAC in Bowling Green, KY. This body of work was developed over the past two years and includes both large-scale and small intimate studies exploring the visual heritage of this region. On exhibit through the end of 2014. Catalogues available here. 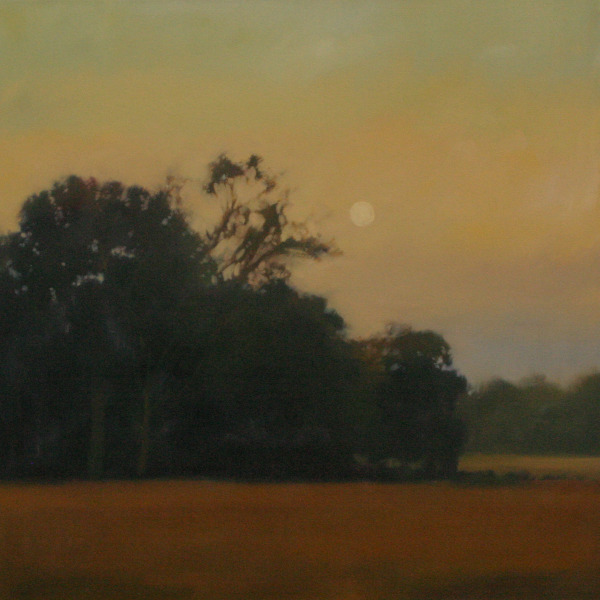 See several new works on exhibit through the end of August at Warm Springs Gallery in Charlottesville. Preview the complete show here. Building Darkness, 48x48 inchesSeveral new works on exhibit at Zeitgeist Gallery, 516 Hagan St. Nashville, TN. Exhibit opens Saturday, Jan. 4th with a reception from 5:30-9 and continues through February 22, 2014. See more details at Zeitgeist-art.com. 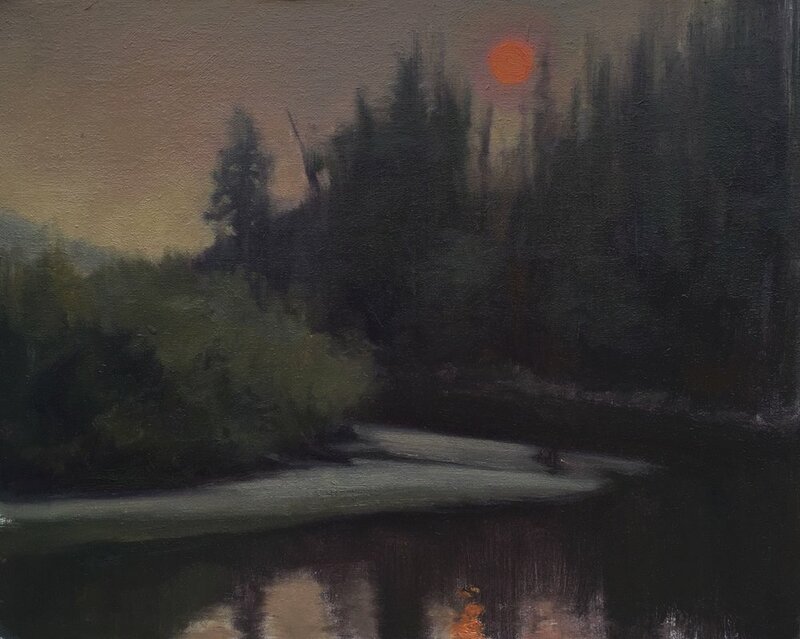 The above image, Evening Home, 12x12 inches, is one of four pieces at Anne Irwin Fine Art in Atlanta for the Small Works show this season. This is a favorite image I've been working with this year. It started as a plein-air study of the view from my childhoood home, and will likely end up as a larger-scale work next year. See all of the works at the gallery website here. Zeitgeist Gallery invited the artists to share studio ephemera, works in progress, and sketches in their current Open Studio show. It is a glimpse into the process of the Zeitgest artists, and on the heels of Jerry Park's recent series at The Arts Company that looked inside the studios of Nashville's artist community, it offers another layer of understanding of what is happening behind those mysterious closed doors. The above piece is a winter study on paper, and is one of several works on paper and ripped-out sketchbook pages hanging through the end of the month. It is an unusually busy October! Three new shows open this month. The first is a guest show at Ann Long Fine Art in Charleston, SC, which opens on October 4th. 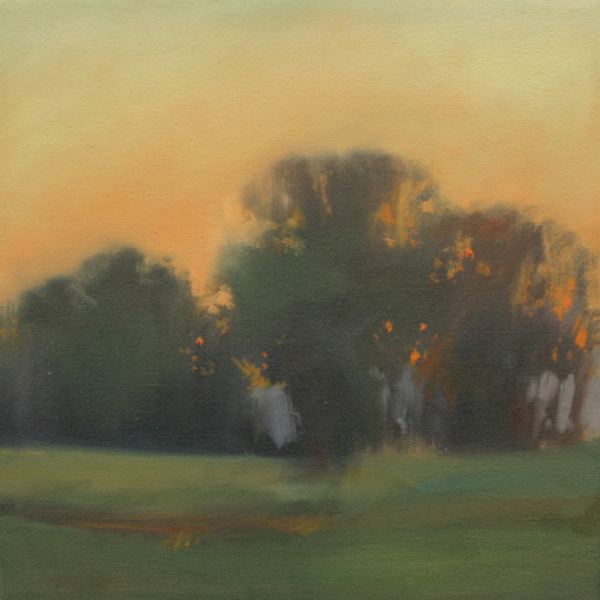 This piece, Warm Dusk, 36x36 inches, is one of several pieces that will be on exhibit this fall. Preview the show here. 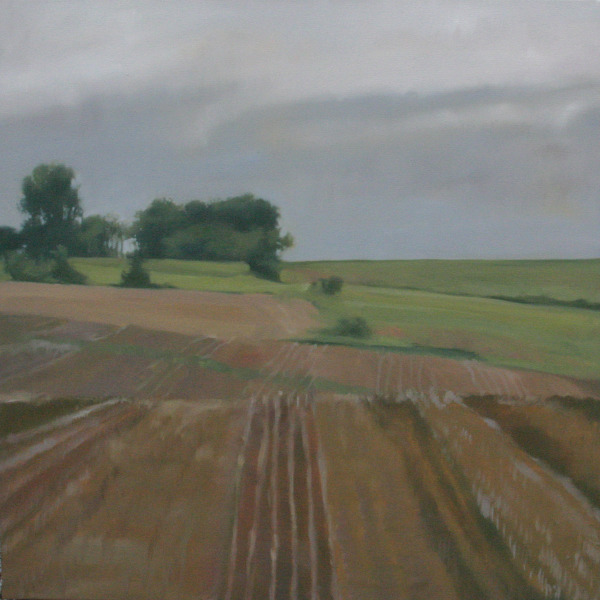 Fallow, 36x36 inches, is one of fourteen works that will be exhibited at the Gateway Arts Council in Sidney, OH, opening October 5th. Works will be on display until November 2nd. More info here. 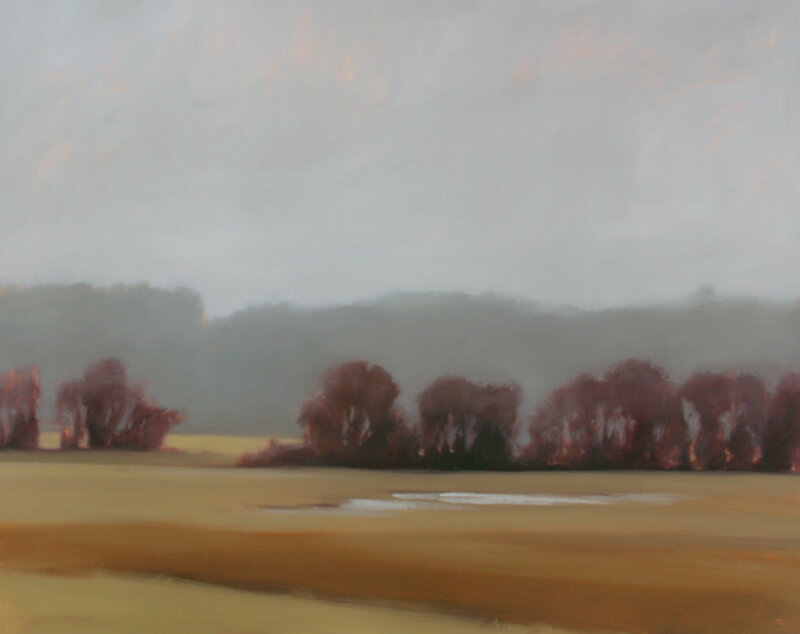 Art Access Gallery in Bexley, OH opens their group landscape show on October 26th from 5-8 p.m. Up the River, 20x60, one of several new works that will be on exhibit. 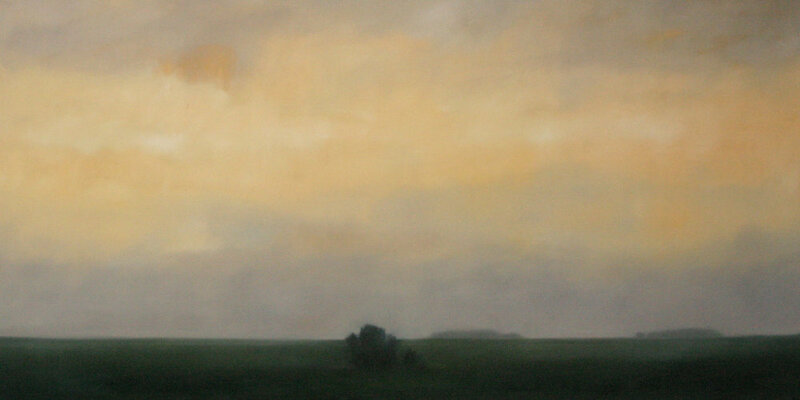 Passing Through, 48x96, one of several new works at Zeitgeist Gallery through May 19th. 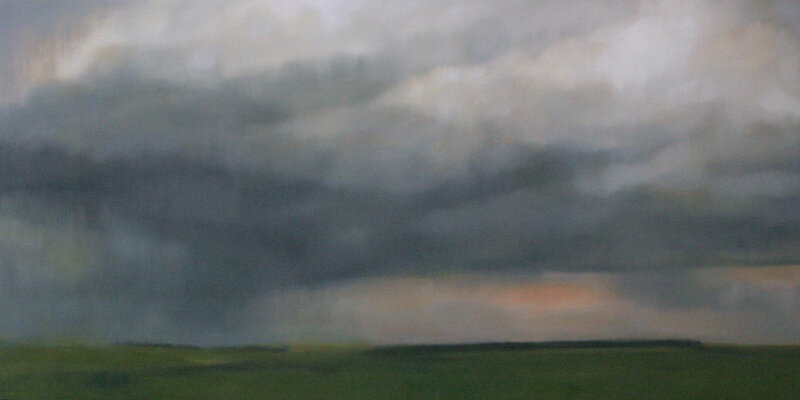 Show opens Thursday, April 5 with opening reception during Hillsboro Village Artwalk. Details here. 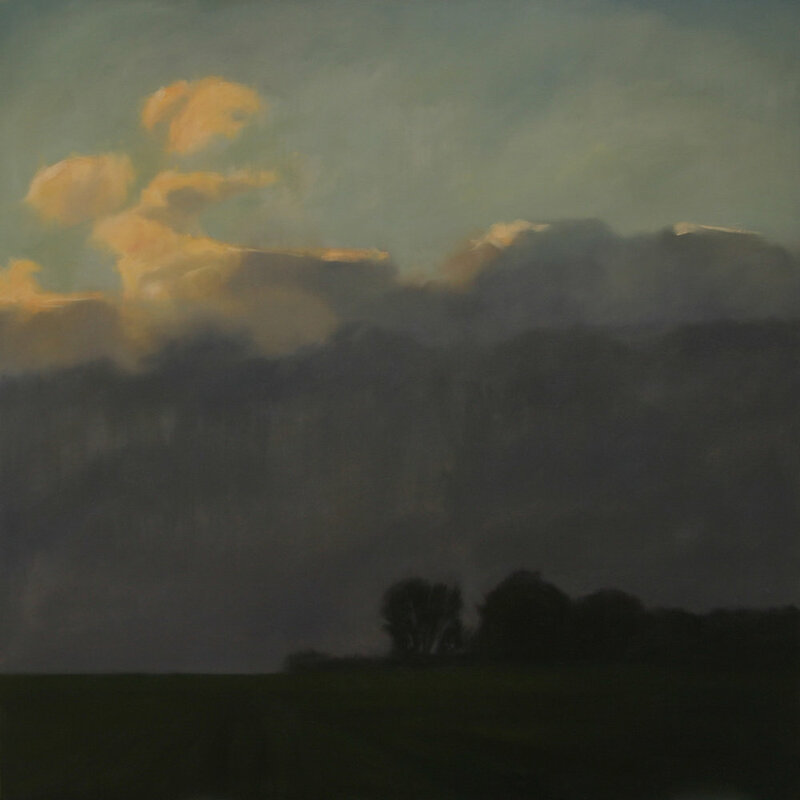 On October 8-9, the Pomerene Center for the Arts will host a landscape painting workshop. 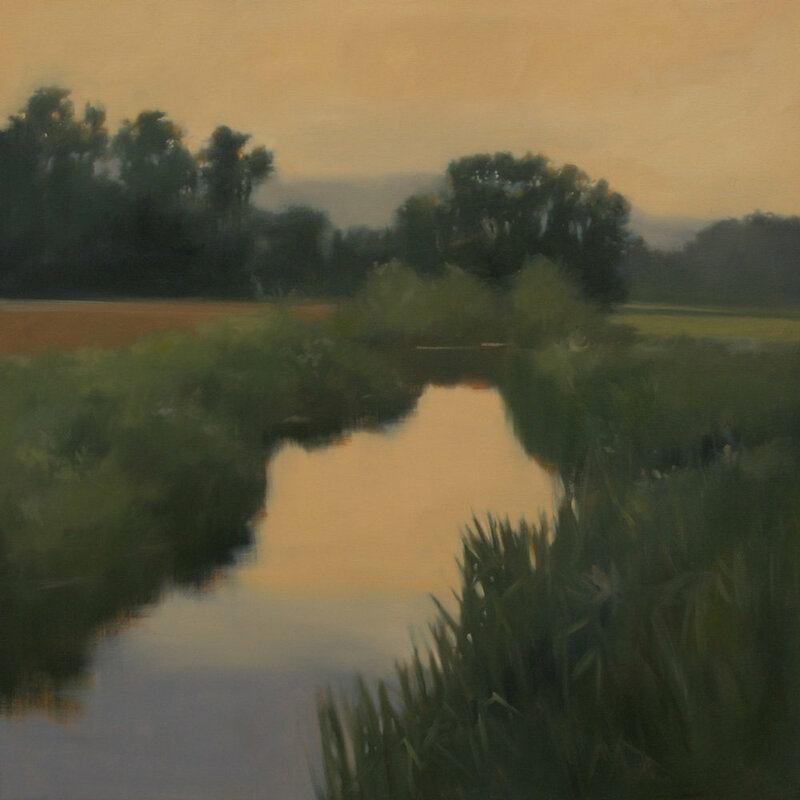 For the first time ever, Megan will teach her own techniques and approach to the landscape, in the setting where she first began painting the subject. Class size is limited-- register here. Featured Artist on Art of Day! If you are in the lovely mountains of North Carolina, be sure to check out Crimson Laurel Gallery in Bakersville. Besides an amazing collection of exceptional ceramic and stoneware, they are now carrying a new selection of paintings. A show of new works opens May 6th at Matre Gallery in Atlanta from 7-9 p.m. Please stop by and see it if you are in the area! Show continues through May 29th.